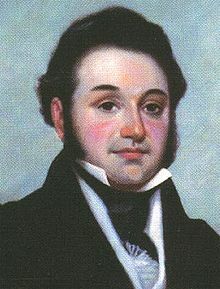 Lorenzo de Zavala, born Manuel Lorenzo Justiniano de Zavala y Sanchez, (October 14 , 1798 – November 15, 1836) was a Yucatán-born Tejano physician who became a career politician, diplomat and author. Zavala had a keen intellect and was fluent in many languages. He was closely involved in drafting the constitution for the First Federal Republic of Mexico in 1824 after it won independence from Spain. Years later, through a remarkable series of events, he also helped in drafting a constitution for Mexico's rebellious enemy at the time, the Republic of Texas, to secure independence from Mexico in 1836. Since his youth Zavala was an indefatigable believer in the principle of democratic representative government. As a young man he founded several newspapers and wrote extensively, espousing democratic reforms — writings which led to his imprisonment by the Spanish crown. While imprisoned, he studied medicine and after his release, he practiced medicine for two years before entering politics. Over his career, he served in many different capacities including the Spanish Cortes (legislature) in Madrid representing Yucatán, and in Mexico's Senate. He became Mexico's Minister of Finance and served as Ambassador to France and Governor of the State of Mexico. In 1829, when the Mexican government was overthrown, Zavala was forced into exile and moved to the United States for two years. He wrote a book about U.S. political culture during this time and also traveled extensively in Europe. With his diplomatic experience and linguistic skills, Zavala was well received by foreign governments. After exile, he returned to Mexico and was appointed as Minister to France. While serving in Paris, Zavala saw that Mexican President Santa Anna was becoming a military-backed dictator, ignoring the Mexican Constitution that Zavala had helped write. Zavala resigned his position in protest and spoke out against Santa Anna. After this schism, Zavala could not return home and fled to Texas, then a Mexican territory, where he owned land. He eventually became an advocate of Texas independence to the point of helping in the drafting of the Constitution of the Republic of Texas, personally designing its flag, and serving as Vice President. Some Mexicans consider Zavala a traitor to his homeland for supporting Texas independence, while Texans consider him a founding father and state hero. In modern-day Texas, there is a county and a city named for him, as well as many schools and public buildings including the Texas State Archives and Library Building in Austin. Zavala was born on October 3, 1788, in the town of Tecoh, Yucatán, Zavala's parents were criollos, Spanish Basques born in Mexico. Zavala was a third-generation Yucatecan. His grandfather moved to the Yucatán peninsula from Peru. Zavala's father, born in 1725, was a notary— a legal representative in Spanish-speaking countries. Zavala was educated in Mérida, Yucatán's provincial capital, in the Tridentine Seminary of San Ildefonso. There he studied the standard curriculum of Latin, morals, scholastic theology, and classical philosophy. After graduation, he founded a newspaper called The Universal Critic (El Aristarco Universal) and wrote for several newspapers in which he espoused democratic ideas that would remain the pillars of his later political career. His writings were critical of the Spanish officials, and he was imprisoned at age 26 for three years by the Spanish Crown (1814-1817). While incarcerated, Zavala learned the English language and studied medical textbooks to an extent that qualified him to practice medicine upon his release. He practiced medicine for two years, then political events compelled him to return to politics. Zavala began his political career becoming secretary of the local government of his home state of Yucatán, which created opportunities leading to his later election to the Cortes (legislature) in Madrid representing Yucatán as its governor. After México won independence from Spain in 1821, Zavala resigned his position in Madrid and returned to Mexico, where he was elected to the newly formed national congress, again representing Yucatán. Zavala became part of a group to draft the constitution of the Federal Republic of Mexico. In 1824, he was elected as President of the Constitutional Congress and was the first to sign the Mexican Federal Constitution of 1824. He served in the Mexican Senate from 1824 to 1826. He was appointed Minister of Finance in 1829, but served only 6 months before the government was overthrown and Zavala was placed under house arrest. He fled to the United States entering a self-imposed exile. During his exile Zavala, ever the scholar, wrote a book called Journey to the United States of North America, a travel narrative similar to Alexis de Tocqueville's Democracy in America, although Zavala's book preceded de Tocqueville's work by a year. Zavala traveled in the northeast U.S. and wrote about U.S. political system and culture from a Mexican point of view. The book was mainly a panegyric, but did point out the hypocrisy of the U.S. for allowing slavery despite professing lofty ideals of freedom. His other notable writing was a two-volume history of Mexico, entitled Historical essay of the Revolutions of Mexico from 1808 to 1830 ("Ensayo Histórico de las Revoluciones de México de 1808 hasta 1830"). He lived in New York, but spent several months in England and France. Zavala's keen mind and his command of Spanish, English, French made him popular abroad. He was made a member of the Geographical and Scientific Society of France and was a received by the Court of St. James's in England. His exile ended in 1832 when he returned to Mexico to serve as governor of the State of México, located just west of Mexico City. (It is one of 32 individual states in Mexico and does not refer to the entire country). He was appointed as Minister to France by then President Antonio Lopez Santa Anna. While serving in this capacity in Paris, Zavala became increasingly aware that President Santa Anna, backed by military force and the clergy, was assuming dictatorial powers and was not observing the Mexican Constitution of 1824 that Zavala had helped create. in protest, Zavala resigned his post in France and renounced Santa Anna, who then ordered Zavala to return to Mexico City. Zavala, for his own safety, moved his family to Texas where he owned land. He arrived in Texas in 1835 by steamboat near the mouth of the Brazos River and briefly shared a house with his good friend Stephen F. Austin who would later be called "the Father of Texas". Other than Austin, the only other Texan he knew before arriving was David G. Burnet who later became Interim President of Texas. Zavala had known Burnet in New York. Both men had been given Empresario Grants in prior years. These grants were designed by the Mexican Government to encourage new settlers to come to Texas from around the world, the hope being to create a buffer zone between Mexico and the U.S. and also to help deal with the hostile Indians in the region. The owner of a grant was given immense tracts of Texas land in exchange for recruiting and being responsible for a certain quota of new settlers— in Zavala's case, 500 families. Zavala and Burnet had sold their grants to groups of investors in New York. The previous summer, Zavala had bought a home on 177 acres (equal to one labor, a Spanish term of land measurement) north of Buffalo Bayou in Harris County, called Zavala Point. This border area contained many immigrants from the United States who were accustomed to a democratic government and individual rights. Animosity against Santa Anna's rule was common and rebellion was brewing. Santa Anna was angered by what he perceived to be U.S. interference in Mexican affairs, and set about to stop the rebellion by dispatching troops. At this point, Zavala's hope was to overthrow the existing Mexican government and restore Mexico to a democracy and to have Texas be one of the Mexican states. Before long, he realized that this was not going to happen. A pragmatic realist, he gradually changed his viewpoint and began advocating for Texas independence from Mexico. Despite orders from Santa Anna for Zavala to be captured and deported from Texas, Zavala was never in real danger — he had become a valuable ally with influential Texans seeking independence. His legislative experience, linguistic skills, and diplomatic experience made him ideally suited for drafting the new Constitution of the Republic of Texas, not to mention that he was the only one among them with actual experience in drafting a such a document. In March 1836, a meeting of delegates was held in a Texas settlement known as "Washington on the Brazos" where the Declaration of Independence for the Republic of Texas was drafted and signed. Zavala personally designed the flag of the new republic, helped write the new constitution, and served as Vice President under the provisional government. While working, the delegates received a message that the Alamo was under siege. After the Alamo fell, Santa Anna's forces were soon advancing on the delegation, forcing them to flee. When Santa Anna's troops approached Zavala's Point, Zavala and his family fled down the San Jacinto River to the home of William Scott, one of the Empressario Grant colonists. A number of families awaited there for a steamer to take them to safety on Galveston Island. Nearby, in Harris County, Santa Anna's army faced Texas General Sam Houston's forces on April 21, 1836 at the Battle of San Jacinto. Santa Anna was defeated and captured. A few months after this, Zavala's health began to fail. He resigned his office of Vice President and returned home. Less than a month after his resignation, he was boating in Buffalo Bayou when his rowboat overturned and he was chilled. Zavala developed pneumonia and died at his home on November 15, 1836. He was buried in a small cemetery plot at his home. The grave was later moved to the San Jacinto Battleground Park. Mexican historians are generally respectful to Zavala for his efforts to create a republic and for improving conditions for the lower class; however, Zavala's apparent reversal of loyalty to his native Mexico and his turning to participate in Texas Independence branded him as a traitor to many Mexicans, a feeling some harbor to this day. In 1807 Zavala married Teresa Correa y Corres. They had three children: a son named Lorenzo Jr., a daughter named Manuela, and a daughter who died at age one. Zavala's wife, Teresa, died in the spring of 1831. Zavala remarried while in exile. He married Emily West in New York on November 12, 1831, at the Church of the Transfiguration. To this union was born a son and two daughters. The son Augustine, the eldest, was the father of Adina Emilia de Zavala, who played a role in the fight to preserve the Alamo as a historic structure for future generations. Zavala and his friends secretly organized the first Masonic Lodge in Yucatán, the Reunión a la Virtud lodge No. 9. The lodge received its charter from the Louisiana Grand Lodge in 1817. It was Zavala's relationship with his fellow masonic brothers and to other lodges that allowed him to gather many political connections prior to Mexico's Independence. Zavala was one of the key people that helped establish the York Rite Masonry in Mexico in 1826 as an alternative to the older, well established Scottish rite (Escocés). That same year the Grand Lodge of New York issued charters to five Masonic Lodges in Mexico City. These five lodges became the nucleus of the movement that favored decentralization of leadership. Zavala became the Charter Master of Independencia Lodge No. 454. He kept his position until his exile in 1830. He is listed as a "Masonic Hero" by the Grand Lodge of Texas. Some sources state that Zavala was disgraced for revealing ritual secrets. The town of Zavala, Texas was named for him in Jasper County in 1834. It no longer exists, but there is a village extant in Angelina County named Zavalla which is also named for Lorenzo de Zavala. In 1858, 22 years after Zavala's death, the Texas Legislature named Zavala County in his honor. Zavala County is in southern Texas, and sits roughly in a triangle formed by Del Rio, Laredo, and San Antonio. The county seat is Crystal City. Unfortunately, when the name was given, it was misspelled as "Zavalla" and the error was not officially corrected until 71 years later (1929). Currently, his name appears on many public buildings and schools, including the Texas State Library and Archives Commission in Austin. The National Hispanic Institute named its Lorenzo de Zavala Youth Legislative Session program (colloquially known as the "LDZ," now hosted at five universities across the U.S. and one in Panama) for him. ^ a b c "A Guide to the Lorenzo De Zavala Papers, 1818-1936". lib.utexas.edu. Dolph Briscoe Center for American History, The University of Texas at Austin. Retrieved 2 February 2017. ^ a b c Fitzpatrick, Vale. "The Portal to Texas History/Lorenzo de Zavala Online: Impresario, Statesman and Texas Revolutionary". education.texashistory.unt.edu. University of North Texas Libraries. Retrieved 24 January 2017. ^ a b c "Lorenzo de Zavala (1789-1836)". lsjunction.com. Lone Star Junction. Retrieved 23 January 2017. ^ Lozano, Reuben R. "The Mexican Texans and their Activities/Lorenzo de Zavala". tamu.edu/faculty (Texas A&M University). Wallace L. McKeehan. Retrieved 27 January 2017. ^ a b c "Texas A&M University/Sons of Dewitt Colony Texas". tamu.edu. Wallace L. McKeehan. Retrieved 23 January 2017. ^ a b c d e "Lorenzo de Zavala". tsl.texas.gov. Texas State Library and Archives Commission. Retrieved 21 January 2017. ^ a b c d e f g Estep, Raymond (May 31, 2016). "Handbook of Texas Online/Zavala, Lorenzo de". tshaonline.org. Texas State Historical Association. Retrieved 20 January 2017. ^ "Lorenzo de Zavala". Texas State Library and Archives. Retrieved 6 June 2010. ^ a b c d e f g h Henson, Margaret Swett (1996). Lorenzo de Zavala: The Pragmatic Idealist. Fort Worth: Texas Christian UniversityPress. ISBN 978-0875651507. ^ Ron Morgan, "Lorenzo de Zavala" in Encyclopedia of Mexico. Chicago: Fitzroy Dearborn 1997, p. 1638. ^ Wright, R. "Santa Anna and the Texas Revolution". andrews.edu. Andrews University. Retrieved 2 February 2017. ^ Polendo, Kamen (October 16, 2014). "Lorenzo de Zavala". press.com. Press. Retrieved 27 January 2017. ^ Joy, Mark S. "Empresario land grants in Texas". immigrationtounitedstates.org. Immigrationtounitedstates.org. Retrieved 28 January 2017. ^ "Empresario Contracts in the Colonization of Texas 1825-1834". tamu.edu. Wallace L. McKeehan. Retrieved 29 January 2017. ^ "Texas Originals/ Lorenzo de Zavala". humanitiestexas.org. Humanities Texas. Retrieved 23 January 2017. ^ "Texas Declaration of Independence". tsi.texas.gov. Texas State Library and Archives Commission. ^ Kleiner, Diana J. (2010-06-15). "William Scott". tshaonline.org. Texas State Historical Association. Retrieved 2 February 2017. ^ "Lorenzo de Zavala". findagrave.com. Find A Grave, Lehi, UT. Retrieved 2 February 2017. ^ a b De Los Reyes, Guillermo (June 1, 1997). "Freemasonry and Folklore in Mexican Presidentialism". The Journal of American Culture. 20 (2): 61–69. doi:10.1111/j.1542-734X.1997.2002_61.x. ^ Normand, Pete (October 30, 2012). "Lorenzo de Zavala – "First Vice-President of the Republic"". grandlodgeoftexas.org. The Texas Masons. Retrieved 1 February 2017. ^ Wooster, Robert (2010-06-15). "Handbook of Texas Online/Zavala, Texas". tshaonline.org. Texas State Historical Association. Retrieved 1 February 2017. ^ "Zavala County, Texas". co.zavala.tx.us. Zavala County, Texas. Retrieved 22 January 2017. ^ "National Hispanic Institute LDZ". www.nationalhispanicinstitute.org. National Hispanic Institute. Retrieved 10 August 2018. This page was last edited on 11 April 2019, at 22:50 (UTC).